I have a great experience in cuisine art and so I have always learnt the best dishes are made in a simple way but with great ingredients. Make this recipe with organic ingredients and truffle of good quality: you'll astonish your guests, believe me!!! - Prepare meat stock; you can make it the day before. - Peel potatoes, clean them with kitchen paper and dice. - Put olive oil in a pan, add potatoes and cook over low heat, stirring often. - Meanwhile bring your stock to a boil and dice chicken breast. - When potatoes are golden, add chicken pieces too. Continue cooking on low heat, stirring often, a couple of minutes. - Stir in rice and then pour in wine too. Let wine bring to a boil and evaporate completely, stirring now and then. Add a ladleful of boiling stock together with aromatic herbs and continue cooking, stirring now and then, until it has been absorbed. Continue adding stock, a ladleful at a time, and stirring now and then until each addition has been absorbed. This will take 15-20 minutes according to the time suggested on the package. Let all cooking liquid reduce well. Season to taste with salt in the last minutes of cooking. - Wait some minutes, add truffles in oil, stir and serve. - If you prepare meat stock with a piece of fresh meat, you can use this boiled meat the days after for making a tasty Italian dish. Let chopped onion saute in olive oil for some minutes, add puréed tomatoes, chives, parsley and a bit of wine. Let cook for 2 minutes and add your meat, sliced. It's very easy to slice the cold meat. Let all these ingredients flavor for some minutes or until all cooking juice is well reduced. Turn off the stove. Serve at once. Besides, if you prepare a real meat stock, your risotto will be very tasty. - You can also use fresh aromatic herbs. - I tasted this recipe both with winter and summer truffle. Summer truffle is cheaper than winter truffle. You have the best result with Tuber melanosporum (winter truffle) but this risotto is tasty with Tuber aestivum (summer truffle) too. 1 25g (1 ounce) jar of black truffle in brine will be enough for this recipe. You can use fresh black truffles too. - You can prepare this risotto all year round. - What about a special Holiday meal, buffet-style with this risotto? It is perfect for your New Year's Eve menu. Prepare a lot of appetizers (Tuscan toasts, canapés, sliced salami, matured cheeses with honey, little pizzas, marinated fish ...), grilled vegetables, savoury pies made with vegetables. At last serve this risotto. Close your meal with a cake and fresh fruit. It's a real Italian meal according to the new lifestyle. Browse our site! Click on "Italian cooking" in the navigation bar and look for appetizer, pizza, focaccia, savory tart directories. You'll be able to find a lot of recipe ideas. - If you have any curiosity on black truffle consult the page I wrote. I lived several years in Umbria, an Italian region where truffle is the king of the table and I could learn a lot od tricks and recipes. - Interested in other recipes with black truffle? 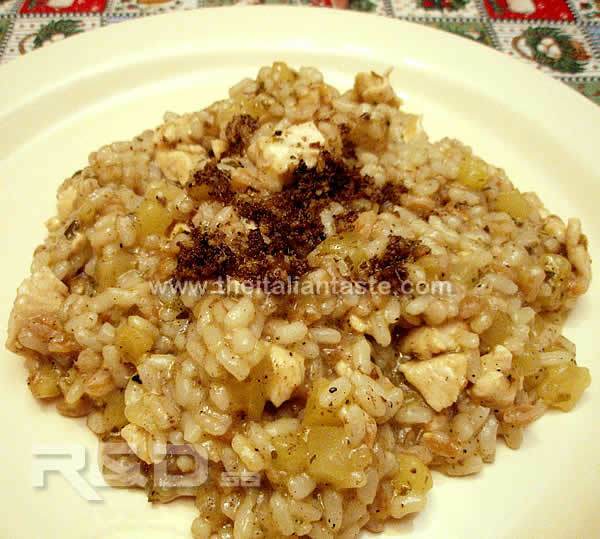 - You may think that this risotto with chicken, potatoes and black truffle is a medium-calorie dish but be careful ... rice amount is only 50g (1 3/4 ounce) per head. Despite this, the portion is also satisfactory for the presence of chicken and potatoes. So it can be a main dish for your family menu, perhaps without black truffle. What's the right wine for " Risotto with potatoes, chicken and black truffles "? You can choose a red wine, pleasant and delicately perfumed with low alcohol or a white wine such as Muller Thurgau or Chardonnay. You can also serve a sparkling wine to match all meal.